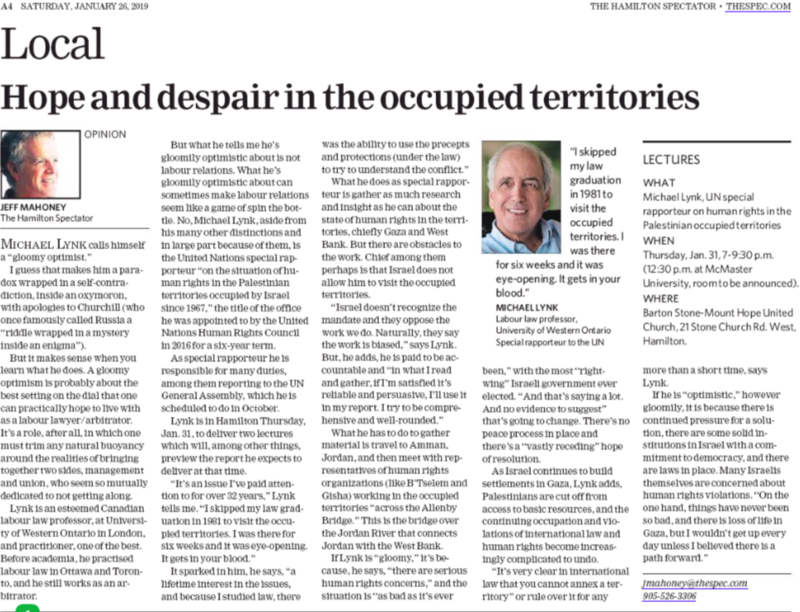 In the Hamilton Spectator on January 26, Jeff Mahoney authored a profile of Michael Lynk, the so-called “United Nations special rapporteur ‘on the situation of human rights in the Palestinian territories occupied by Israel since 1967,'” that was marred for his failure to note that instead of being neutral and judicious, Lynk engages in anti-Israel advocacy in violation of the UN code of conduct. 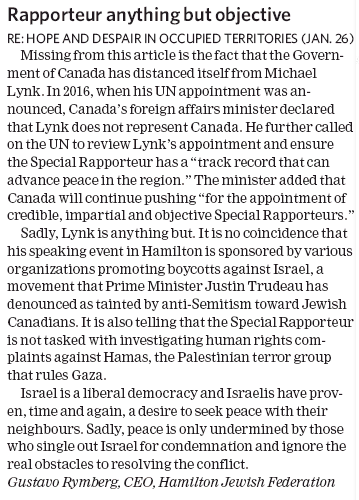 Importantly, Lynk is speaking at an event organized by the anti-Israel organization CJPME, whose leader Dimitri Lascaris, was condemned for making antisemitic remarks by Prime Minister Trudeau, the opposition Conservatives, the NDP and Green Party. UN Watch says Lynk has a three decades long history of ardent anti-Israel advocacy and that Lynk “cited Nazi war crimes in his call for ‘legal strategies’ to prosecute Israelis,” that he supports a protest movement known as “Israel Apartheid Week” at Western, and that he “blamed the West for provoking the attacks” on 9/11. 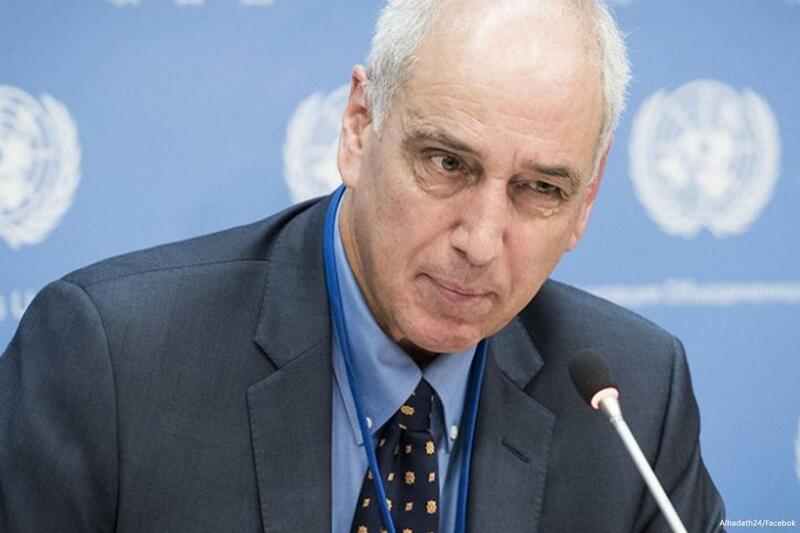 As well, NGO Monitor has extensively chronicled Lynk’s anti-Israel animus in a report entitled: “Special Rapporteur on Israel: The UN’s Weakest Lynk”. Lynk is far from an objective arbiter of this conflict. His one-sided criticisms of Israel continues in this article as he cites the “most ‘right-wing’ Israeli government ever elected” and Israeli settlements as being the sole impediments to Mideast peace. Lynk never mentions how Gaza is run by the terrorist organization Hamas which is committed to Israel’s destruction and the West Bank is administered by the Palestinian Authority, Israel’s supposed partners for peace, who continue to incite, glorify and financially reward terrorists, all the while refusing to negotiate peace with Israel. Sadly, the United Nations has been long hijacked by antidemocratic forces, dictatorships and state-sponsors of terror who instead of protecting international order and national security, ignore tyranny and carry out mass murder, embolden terrorists, and who enable human wrongs, instead of ensuring human rights. Take action now! HonestReporting Canada encourages its subscribers to send a letter to the editor to the Hamilton Spectator. 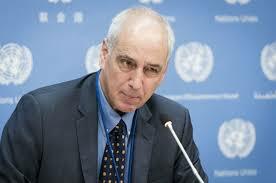 Please refer to Jeff Mahoney’s January 26 profile entitled: “UN Special Rapporteur to preview Palestinian Territories report at Hamilton lectures” and point out that instead of being neutral in accordance with UN standards, Michael Lynk engages in anti-Israel advocacy. Send letters to: letters@thespec.com.